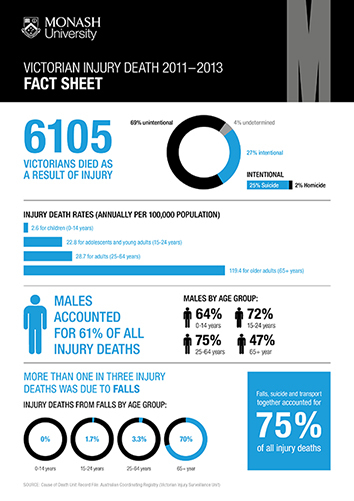 E-Bulletins summarise the analysis of the latest available year of death or unintentional hospital-treated injury data overall and by age group (children aged 0-14 years, adolescents and young adults aged 15-24 years, adults aged 25-64 years, and older adults aged 65 years and older). Analysis covers the frequency, rate, trends, causes, location, type of injury and body region injured. These selected fact sheets are based on information requests to VISU. Authorised by: Chief Marketing Officer, Strategic Marketing and Communications. Maintained by: Accident Research Centre Webmaster Team. Last updated: Oct 2018.